hd01:08CIRCA 1966 - The Gemini XI makes a water landing; astronauts Charles Conrad and Richard Gordon are picked up and brought aboard the USS Guam. hd00:21UNITED STATES 1960s: View of parachute from aircraft / Man looks through camera in aircraft / Parachute over water / Man looks through camera / Parachute falls in water. 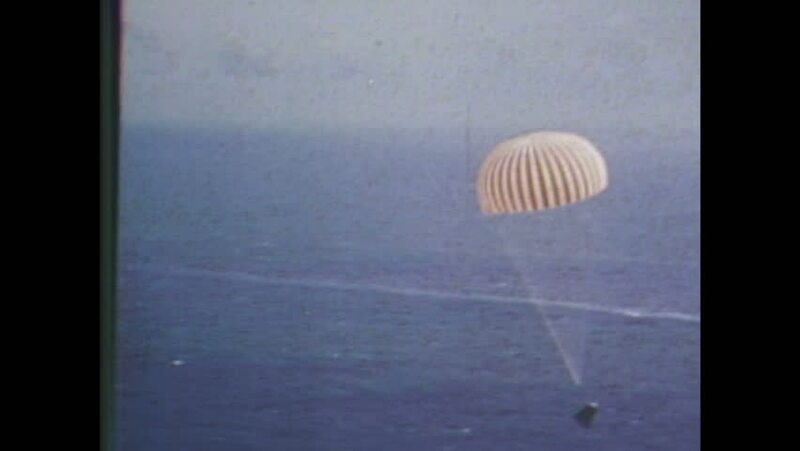 hd00:321960s: Gemini XII capsule soars over ocean with parachutes until splashdown near ships. frogman in SCUBA suit jumps from helicopter into water. sd02:06CIRCA 1950s - Paratroopers are airdropped with equipment. They install a communication system at their landing in the 1950s. 4k00:14avocado on toast bread with spices on a striped black white background. The concept of healthy eating. hd00:321940s: Girl laughs. Doll emerges from under wicker bowl, tangled in ball of yarn, knocks yarn off of ledge. Yarn lands on teddy bear; teddy bear pulls yarn, causing doll to spin and fall off ledge.